A quick note here just in case any of my readers/followers were alarmed by the new theme and a few disappearing test blog posts from this afternoon. I thought that changing the theme would suffice but on this occasion it didn’t. I had to go combing through my WordPress folders, looking for files older than the most recent version update, and examining them for evil code. (In case this is helpful to anyone else, the files were ms-ravel-roil.php and template-incidental-tout.php in the wp-includes folder.) I assume these files (which contained blocks of incomprehensible 64 bit code) were somehow corrupting the new theme as it was installed, but once I had deleted them, I was able to install a new theme without further problem. Let me begin this by sharing the happy news that Heidi Czerwiec’s chapbook, “Self-Portrait as Bettie Page” is now available. Huzzah! Unfortunately I haven’t received my Barefoot Muse Press copies yet, probably because of the Holiday mail, so I do apologize to the individuals who generously pre-ordered copies from me. I promise I’ll get them to you as soon as possible. That’s Sofia. She is 8 weeks old, weighs about 2 pounds, is completely fearless, and has won the heart of every member of the Evans family, with the exception of grumpy old Tasha and possibly the fish. Furthermore, taking a leaf out of her book I have just done a little intrepid exploring of my own, and have now fixed things so I can post blog entries from my iPhone and my iPad! Look out (potentially?) for more frequent blog posts! AT&T Steals Candy From Babies, It’s Official! Earlier this year Lorna’s cell phone died–teenagers are hard on cell phones–and as she wasn’t due an upgrade, we switched her SIM card into Keba’s old iPhone 3. We made her SWEAR not to incur any data charges, as there was no plan on the phone, and Lorna being Lorna, she did exactly what she was told. Today, I was nosing around on the AT&T website to check on everyone’s upgrade status. Ever since Lorna got her Dad’s iPhone, Becky has been mounting an unsubtle campaign for her own iPhone (for which, given my own love for my iPhone, I have some sympathy.) Becky’s phone also died pre-upgrade availability and so she has MY old regular cellphone, which is basically held together with duct tape. Keba’s concern was that she might not be as responsible about non-data usage as Lorna, and so he asked me to find if there was a way to limit or block data usage altogether. “If AT&T determines that you are using an iPhone on your account without an eligible data plan, AT&T reserves the right to add an eligible data plan to your account and bill you the appropriate monthly fee.” WTF again, AT&T? Soooo, I got hold of a nice young online chat representative named Shaun. Now, let me express at the outset my entire satisfaction with Shaun and his handling of the chat/my concerns. My problem is not with AT&T’s customer service, it’s with their (lack of) principles. Shaun Poirier: Okay I have reviewed the account, and thee was a notice sent to the phone on 03/15/2012, when putting a sim card into a Iphone will generate a response in the system to add a data package. 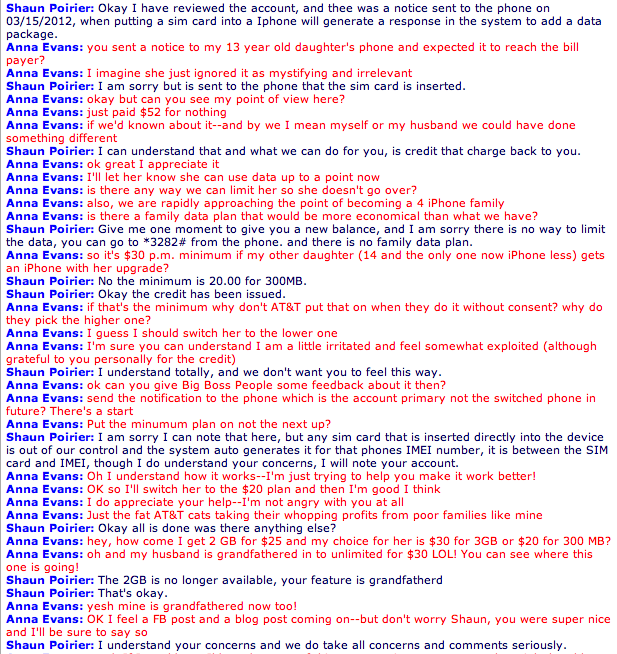 Anna Evans: you sent a notice to my 13 year old daughter’s phone and expected it to reach the bill payer? Shaun Poirier: I am sorry but is sent to the phone that the sim card is inserted. Anna Evans: okay but can you see my point of view here? Shaun Poirier: Give me one moment to give you a new balance, and I am sorry there is no way to limit the data, you can go to *3282# from the phone. and there is no family data plan. Anna Evans: so it’s $30 p.m. minimum if my other daughter (14 and the only one now iPhone less) gets an iPhone with her upgrade? Shaun Poirier: No the minimum is 20.00 for 300MB. Shaun Poirier: Okay the credit has been issued. Anna Evans: if that’s the minimum why don’t AT&T put that on when they do it without consent? why do they pick the higher one? Shaun Poirier: Okay all is done was there anything else? Anna Evans: hey, how come I get 2 GB for $25 and my choice for her is $30 for 3GB or $20 for 300 MB? 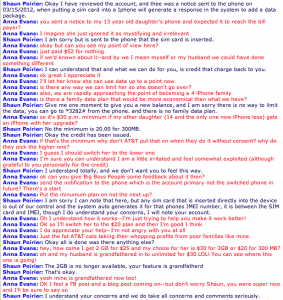 Anna Evans: oh and my husband is grandfathered in to unlimited for $30 LOL! You can see where this one is going! Sooooo, we’re talking about a situation where AT&T charge more and more, on a monthly basis, for less and less data. We’re talking about a situation where AT&T make it impossible for you to use an iPhone (with all its teen-magnet features) without a $20 p.m. charge minimum per phone, DESPITE the fact that Apple make it possible for you to switch off data connectivity on the phone. We’re talking about a situation where AT&T can impose new monthly charges without the billpayer’s knowledge or consent. Which means we’re talking about corporate theft, basically. Stealing. Candy. Babies. Just saying. I’ve always found this question difficult to answer, but lately it’s becoming a little ridiculous–I feel like I have as many hats as Imelda Marcos has shoes. Let’s recap the day so far and see if it helps. I got up, woke the kids (sequentially), made their lunches, and saw them onto their respective school buses. I’m a Mother, then, that much is both crucial and important. I went to the gym. To an extent that makes me a Lady of Leisure, I suppose, or at least someone who is in control of her own time. I paid in some checks at the bank–the checks were either for teaching (One private lesson, one WWAC session, one Care 1 session) or for pre-orders of anthology copies. I walked Sam. Dog-owner, then. Yes, for sure. 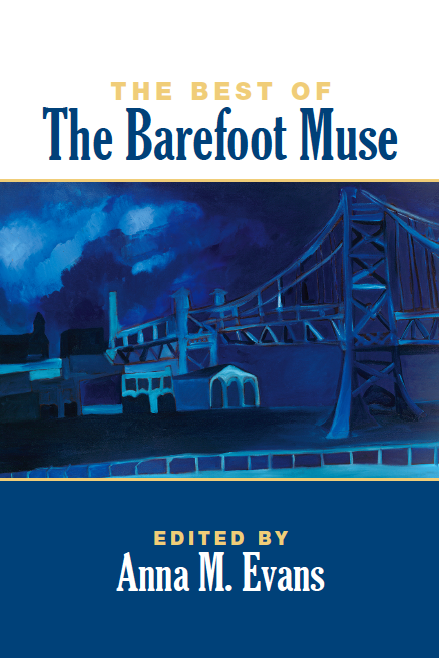 The second proof of the Best of The Barefoot Muse anthology arrived, and I spent some time with it, also setting in motion the next steps towards making copies generally available. 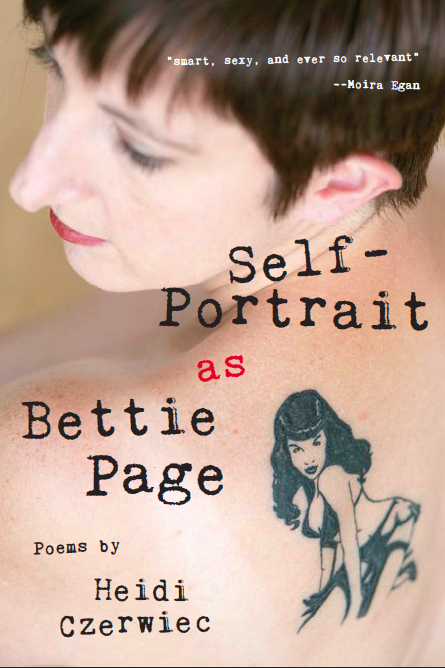 I am the Managing Editor of Barefoot Muse Press! Yay me! Seriously, this is perhaps the thing that is currently giving me the most satisfaction–I love playing with the technology and the project plays to all my organizational strengths. I went to the Care 1 facility to do a Christmas poetry project with my Alzheimers seniors. Teacher, then, yes. But even that is partitioned further–WWAC, Care 1, plus I have a residency coming up at Hainesport Elementary School and an interview next week to adjunct at Richard Stockton College of NJ. I came home and drove Becky to Gymnastics practice. Ah, Mother again. Goodo! I checked in on the online quantitative research I am managing for my husband’s company, Global Bridge. Oh, that’s right–I’m the Vice-President and Junior Partner in an International Sales & Marketing consultancy–I forgot that part. I rated a couple of poems for Reena Heenan’s forthcoming online website of weddings poetry. Yep, Judge. I haven’t written any poems recently but I’ve had acceptances from Verse Wisconsin and 32 Poems, so I guess I could call myself a Poet. I didn’t do anything on the Raintown Review today but I’m definitely the Editor of that, in addition to being the Online Architect of the Schuylkill Valley Journal and Essay Co-Ordinator for the Mezzo Cammin Women Poets’ Timeline Project. 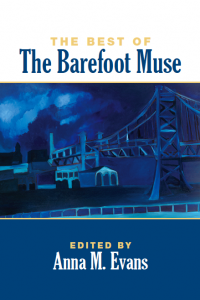 I enjoyed playing with Createspace so much I bought the company…No, of course I didn’t, but I did buy in to the idea of using the POD service to produce a Best of the Barefoot Muse anthology in print. You remember the Barefoot Muse, of course? The formal poetry e-zine I began in 2005 that ran for 11 issues before I finally realized something had to give? It had always been my intention to use the material to create a print anthology one day, but this intention crystallized as I worked through the CD production process. How hard could it be to do a book? The material already existed, and poets tend to jump at the chance to have their work anthologized, even if all they get out of it is a contributor copy. Seriously though, I now understand all about section breaks, headers and footers (which is essential–one easy way to tell an amateur POD book from a professional one is to examine the complexity of the footers). I know how to use styles to generate a clickable Table of Contents. And the best thing is, I’m getting to reacquaint myself with all the excellent poets and poems I published over the years. Hats Off to Amazon’s Createspace! It literally took me 12 days from having the idea that I should use Createspace to market my CD, to making my first sale. Wow! Every time you make changes to the artwork files or even the setup details for your project, they have to be resubmitted for the review process, so don’t submit them the first time until you are sure you have them right. I had to go through this process twice because of changing my website to www.annamevans.com halfway through. The artwork production software at Createspace is actually very versatile. Lots of clipart photos and variations on the basic designs. Spend some time drilling down to find suitable unique images and don’t just settle for the first thing you see. You can also upload your own photos, such as a picture of yourself. Once your files have been reviewed and okayed, you need to order a proof and check it carefully. I played my CD on my Mac, on our antique CD player, on my daughter’s PC and in my car. Gotta take Becky to the gym. It simply remains for me to give you a link for purchase! 😉 Buy now! Welcome to the first blog post from my blog’s new home at www.annamevans.com/wordpress/. Yes, having succumbed to iPhone madness in my last post (although in my defense this was several months ago!) I have now succumbed to ‘Own Your Domain Name’ fever and purchased annamevans.com. In case you are interested, I’ll run you through the thought processes. At the marvelous Push To Publish conference this past Saturday, I was introduced to the capabilities of Amazon’s Print on Demand company, Createspace, and determined to, at the very least, attempt to market the recorded CD that I had previously home produced using my Mac and printer in a more professional fashion. While investigating domain name purchase I discovered that the business hosting I use through Godaddy for our Consultancy company, Global Bridge, was a) vastly superior to Comcast’s b) with a minor upgrade, able to support an unlimited number of independent domain names. Hence I can also transfer the domain name barefootmuse.com, which I desire to remain in my possession for the foreseeable future, to the Godaddy servers, and stop paying Yahoo small business $12.95 per month for what is, again, an inferior service. I’m in the process of taking this step (Domain transfer is a little more complicated than new domain registration) and ultimately expect the decision to pay for itself in short order. I’m now trying to think if there is anything else I ought to update my long-suffering readership on before leaving this to go update some blog links. Hmm! Sammy the Face Destroyer is on a diet, and suffering with it! Becky seems to be dealing with High School. Poetry stuff is largely going well. Oh yes, and we are having a reading to celebrate the launch of the new issue (10.1) of The Raintown Review this coming Friday at 7 p.m. The Parlors, St. Joseph’s College in Brooklyn. Maybe I’ll see you there and I can bore you some more about website administration!